Thanksgiving is later this week and as all holidays are known to do from time to time, it is showing up a time when I don’t feel particularly in the mood. I don’t know what is going on in your life, but there are plenty of hardships to go around. Many people in the States are still dealing with houses destroyed in hurricanes, wildfires, and tornados. I have a friend whose brother recently died on her birthday. I have several friends who have asked for prayers for themselves or others who are fighting ongoing disabilities and/or disease, struggling with grief, or just worn thin caring for others. Life, at any age, isn’t for sissies. It takes a considerable amount of courage to face some of life’s hurdles and occasionally we run out of gas, and our courage quota hits empty. You may have noticed that it has been weeks, four to be precise, since I last wrote a blog post. My husband and I have been dealing with some financial issues since my last paycheck came in December of last year. At times the last couple weeks, these problems have consumed time and sort of sucked the life out of me. Our pastor reminds us that worry is the belief that God won’t get it right. My husband tells me that despite what things look like – God had shown us blessings before when we were at a low ebb and that we can absolutely have confidence that we will not be abandoned now. In fact, during these same weeks one amazing gift happened. We were trying to sell two paintings that my husband had painted. We first offered them for sale to our friends and family on Facebook. Several people said that they were beautiful, but no one seemed interested in buying them. We thought we had asked a modest price – but that didn’t bring us a buyer. At the time, my husband was his usual sunny self while I had to work on my personal character flaws du jour: irritation, impatience, and frustration. Some weeks later I asked a question on Facebook about what would be a better venue for trying to sell them. Several friends replied with suggestions. But about the same time, a friend sent a private message saying that he wanted to purchase both paintings. Not for the price mentioned but for many times more than the price indicated. So, I asked for the address where we should ship them, and I was told that he wanted us to give each of the paintings to someone who would be cheered by them. What a blessing! A blessing to us, we hope to our friends who will receive the paintings, and to the purchaser of the paintings according to his own comments to me. The other day another thought struck me. I was dusting a neglected corner and saw an unusu al vase that my father resurrected. 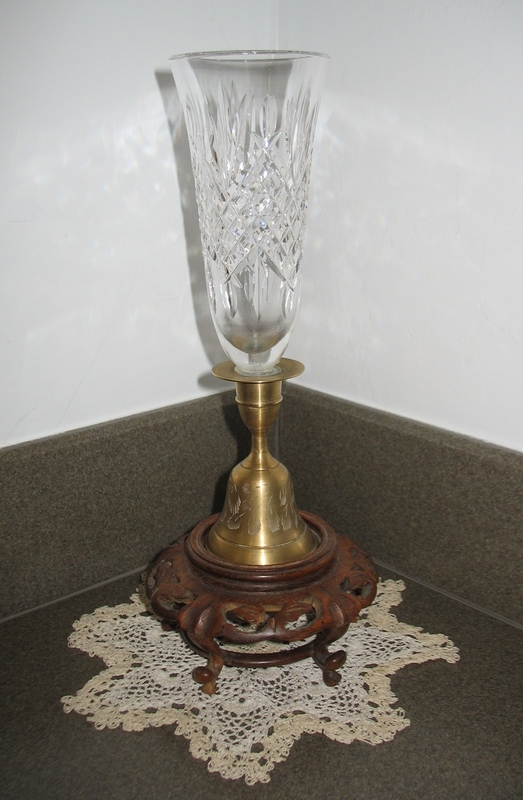 It started life as a beautiful cut crystal vase. My father loved the real deal and wouldn’t have pressed glass because he liked the way cut glass reflected the brilliance of light. Well, many years ago this particular vase was knocked over and broke. My father was not about to let this vase go to waste. So he thought outside the box. He took the vase and smoothed out what was left of the stem. 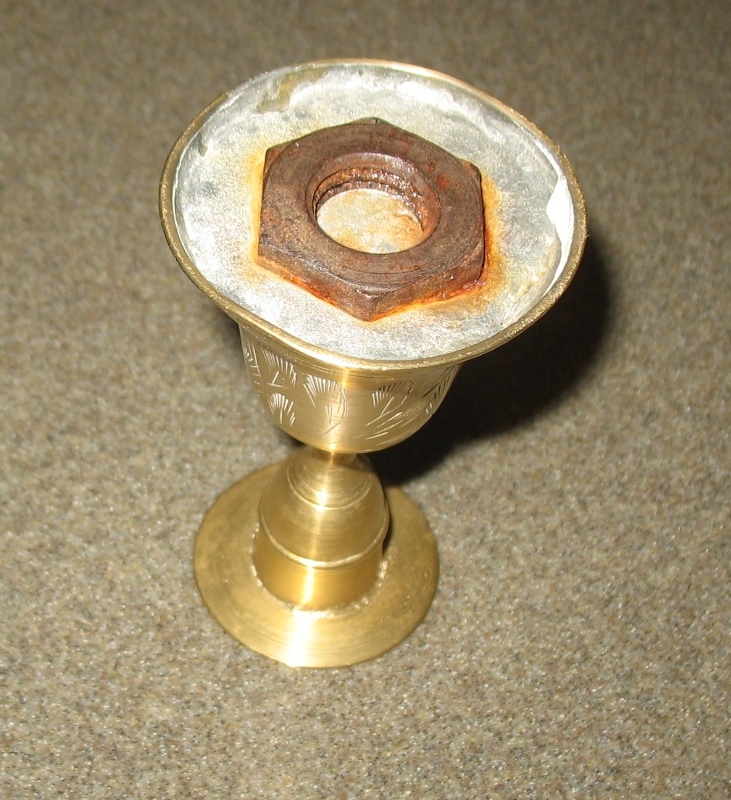 He found a brass candleholder and poured some lead solder into the base for extra weight. 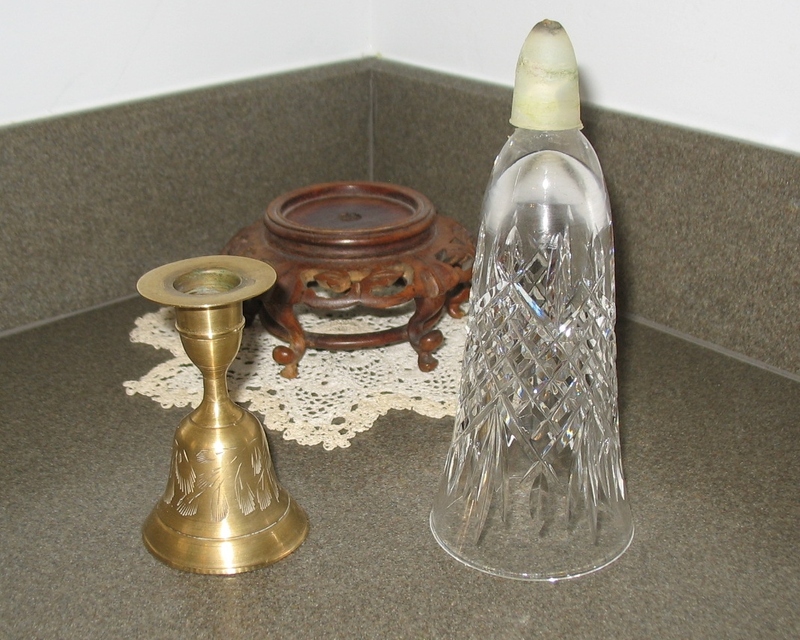 Then he put what appears to be epoxy around what was left of the stem of the vase so that it would sit snugly inside the candlestick. Suddenly he had created a new vase – and one unlike any other. Sometimes it is the little things in life, such as thinking of others, or thinking outside the box, or remembering the unexpected rainbows that follow the storms of life, that help us prepare to be thankful. Despite whatever trials we may have in our lives – all of us have many things for which to be grateful. This day – as I give thanks – I give thanks for all of my readers and pray that you may be blessed abundantly. This entry was posted in Courage, Family, Life in these times, Poverty and tagged Blessings, Faith, God, Marriage, Memories, Prayer, Thanksgiving, Trial. Bookmark the permalink. 1 Response to Curve Balls. Worry. Thanksgiving.